On Saturday, the San Anselmo Chamber of Commerce announced that George Lucas had given some downtown land to them. The vacant building would be torn down and a park, complete with statues of Yoda and Indiana Jones, would be erected in its place. Perhaps I’m a curmudgeon to think so, but this doesn’t seem like the best idea. George Lucas owns 535 San Anselmo Avenue, a one-story, roughly 6,000 square-foot building with three retail spaces (parcel number 007-213-24, if you care about such things). The 1970s-era building opens onto the police parking lot in the rear and lies adjacent to Town Hall. According to Patch, Lucas was approached by the San Anselmo Chamber of Commerce to donate the land and building, together worth about $2 million, for a park. For those of you who don’t know, George Lucas is a San Anselmo local. He’s been heavily involved with town improvements, and you can see the results along Miracle Mile in front of United Markets. The recent demolition of the very old Amazing Grace Music building and the renovated replacement just up the median is his handiwork. In a much more high-profile case, Lucas recently pulled out of his Grady Ranch film studio project in Lucas Valley over neighborhood opposition, vowing to put affordable housing at the location instead. Though a park, without considering the context, can be a good thing, if we pull back our view from the site and look at all the networks in the area, it doesn’t make sense. First, we have the parcel’s current use, as retail. San Anselmo lives on sales tax, and a large part of that comes from downtown merchants. Though a park may attract more people to downtown, it’s likely they will mostly be geeky tourists and those of a sort that see the World’s Largest Fork. The park would ride on the cachet of Lucasfilm’s characters, and it’s doubtful the tourists would generate enough revenue to offset the loss from what would be there otherwise. That space will not remain vacant forever, and when it is filled it will be more valuable as productive land than as value-enhancing park space. Creek Park and Town Hall’s front lawn are our green spaces, and they have served well as the town’s living heart. Even more valuable would be to demolish and rebuild as a two-story structure with housing above. The second floor could provide four to six units, depending on size, and would lock in another four to six families to do most or all of their shopping downtown, boosting sales tax for the town. If the units are studios or one-bedrooms, both of which are in short supply in Marin, they would likely be starter units for 20-somethings that want to live in town, or empty nest units for people that want to downsize out of their family home, meaning they would add value to the school district without adding children to the district. That brings us to San Anselmo as part of the regional housing market. George Lucas wants to build houses in Grady Ranch; why not focus on building them in the center of our towns instead, in places like 535 San Anselmo? From an urban perspective, the buildings at 535 are important for the town center’s “urban room”. They’re part of the wall of interesting shops and businesses that line San Anselmo Avenue. Think about that curve in the road by Hilda’s Coffee and the feeling of security and home you get standing there. How different that is from the feeling we get on South San Anselmo Avenue! That difference is what separates a true downtown from just another commercial strip. Demolishing 535 would open up the room to a parking lot, giving uninterrupted views from the Coffee Roasters to Library Place and the fences behind. 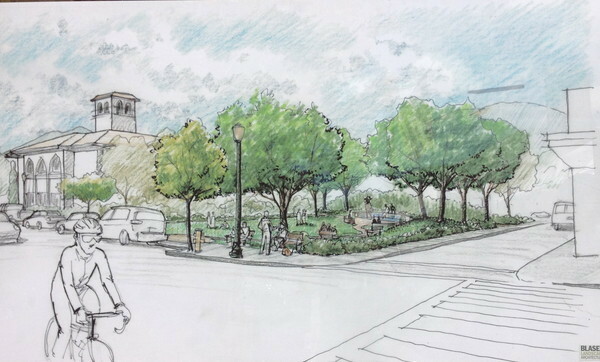 Though good landscaping in the park could minimize that damage, a too-open street with views of noninteractive buildings and a parking lot deadens the streetscape. Unless something else is built behind the park to interact with it and block the views, the park would likely be a loss to San Anselmo Avenue’s streetscape. Downtown is also part of the Ross Valley Flood Protection District, and our urban core could get a major overhaul. Though it’s still in preliminary phases, the plan calls for the shops that extend over the creek, behind the Coffee Roasters, to be demolished. This would mean a new extension of Creek Park, which would render the Lucasfilm Park extraneous. Alternatively, it could mean a complete reshaping of downtown; let’s build a park if someplace needs to be demolished to keep the town safe, not just because the Chamber of Commerce thinks it’s a good idea. This park should not go through. Despite the positives it may bring, the potential downside of a missing tooth is too great for San Anselmo to ignore. If the Chamber wants to boost business downtown, it should not do so by demolishing shops for open space. It should do so by strengthening our center and getting people to live downtown. Our merchants, and the character of our town, thrives on residents, not visitors. A park to attract visitors instead of shops to attract shoppers would move us into a more fickle, less stable situation, and that’s a bad idea.